This is my Gorillapod, and my picture of the day for the 4th March, 2009. 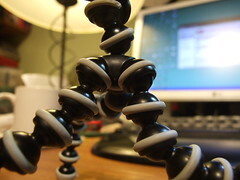 A Gorillapod is a 'go anywhere' camera tripod. It grips onto things, stands on surfaces etc. The one issue it sometimes has is being short, but then it goes places other tripods can't.